Updated 09/15/2011: I’ve reversed my opinion of the liners since I wrote this post. I began to have less effective rest after a few days. Last night I removed the liner and ended up sleeping well despite only having about five hours of rest. It’s still possible it was a fluke but in the end I’m not sure these really add much. I can’t say with certainty whether or not they improve or inhibit rest but for the cost and uncertainty I’m ruling that they just don’t make much of a difference for me. I still have 28 more liners left so I may try them again. If my opinion changes I will update this note. Updated 10/25/2011: I’ve tried them a few more times since my last update and I still haven’t seen that they help me. However, my wife tried one (that wasn’t even fitted for her mask) one night and thought that it made a big difference with her medium ResMed Quattro FX mask). I’m going a different route. I’ve ordered a Pad-a-Cheek Mask Liner. I’ll add a new post after it arrives and I’ve had a chance to use it a few nights. After recent spell of a few nights of bad sleep I started looking into anything that might help prevent mask leaks. Fortunately, I managed to make a few changes that let me sleep well without any new CPAP equipment. Yet, I had already ordered some mask liners after reading various product reviews and a few forum posts. 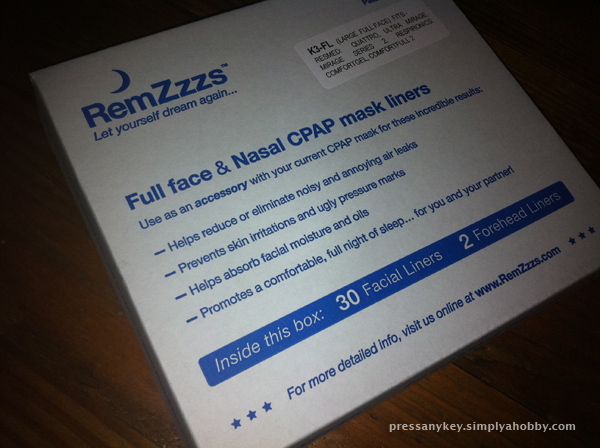 Last week I purchased a set of RemZzzs Padd Full Face CPAP Mask Liners from CPAP.com for $24.95 (before shipping). Note that you can purchase these from other suppliers but it’s important to ensure that they’ll fit the mask and mask size that you use. CPAP.com has a chart on the mask liner page that will match up different masks with the appropriate liner sizes. In my case, since I use a Resmed Quattro Full Face Mask (Large) the chart listed the “Large A” mask liners as my preferred size. I was skeptical of whether or not these would make a difference. The reviews were mixed, but overall they were positive. I decided to go ahead and spend the money. It’s probably an easy decision for anyone suffering from sleep apnea. Whenever I’ve had bad nights I’m often willing to spend whatever it takes to get a good night’s rest, if I can afford it. I’ve used a liner three nights in a row and I think it’s an improvement. Granted, it’s possible that I’ve just had good nights that had nothing to do with the liner. I’m not certain at this time but so far it doesn’t seem to have caused any problems either. The liner did seem to make the mask slightly more comfortable and the seal a little bit easier to maintain. As an added benefit, it should reduce the amount of oil transferred from my face to the mask seal, which will help increase the seal life. I can see how some might find it uncomfortable. The upper flaps do come close to touching my eyelids, but I’ve been able to sleep without it bothering me. Some reviewers mentioned simply clipping the liners. After three nights the liner seems to have held up fine. Each morning, when I’m finished with the liner, I put it between the pages of a small hardcover book to maintain its shape. Hopefully, each liner will hold up for several days and have a positive effect on my sleep. 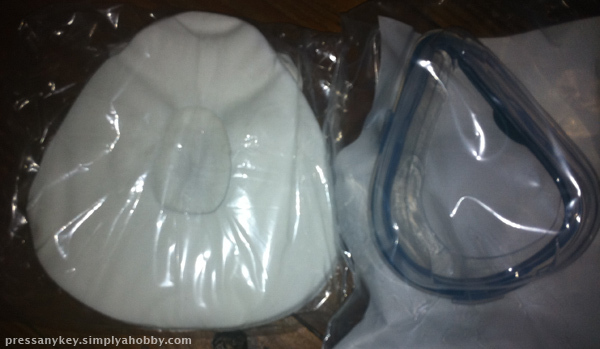 A stack of mask liners on the left next to a new Resmed Quattro mask seal (large).